← Soup in a flash! One year ago today, I finally took the plunge and began writing this little blog of mine. I wanted to start years before, but was dealing with other things that unexpectedly came along. No matter…it all worked out, and here I am, 365 days later and still going strong! That being said, this might just be the most anti-climactic blog birthday ever! Life has been totally crazy and the thought of baking myself a cake was short-lived…especially after the marathon cookie baking we did this past weekend. So, I’ll just showcase one of the new cookies we made that I really enjoyed. Jaida from Sweet Beginnings shared this recipe in our latest swap, which was for holiday baking ideas, and I was the lucky one who got this deliciousness in cookie form. It’s SO good, and so easy you can practically make them with your eyes closed. They’re going to be a perfect new addition to our big assortment this holiday. If you’re looking for a new cookie to add to your dessert tray for the holidays, make it this one! They’ve made IWBTC’s first birthday that much more special 🙂 Thanks again for all of your support!! Preheat oven to 350 degrees. Line baking sheets with parchment paper. Beat butter and sugar on low speed until fluffy. Add vanilla, mint extract, coloring and egg. Mix well. Combine flour and baking powder in a bowl, then slowly add to sugar mixture while mixing. Once combined, stir in chocolate chips. Drop tablespoons of mix on sheet pans about 2 inches apart. Bake 7-9 minutes or until set. Cool on racks. 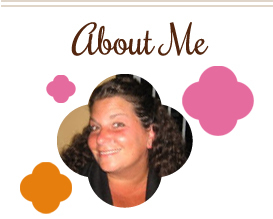 Happy anniversary to your blog!! 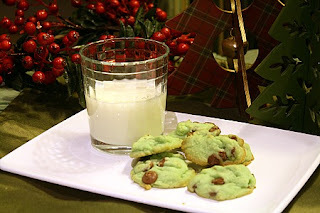 I love mint chocolate chip and these cookies have been on my to-make list since I saw them on Jaida’s blog. Happy 1st blogiversary. I look forward to many more!